Public art, it seems, has come to this. And by this, we mean jewelery store Zales, which is the presenting sponsor of the Valentine to Times Square, which will stand at the foot of the TKTS Stairway to Nowhere in Father Duffy Square from Feb. 13-22. 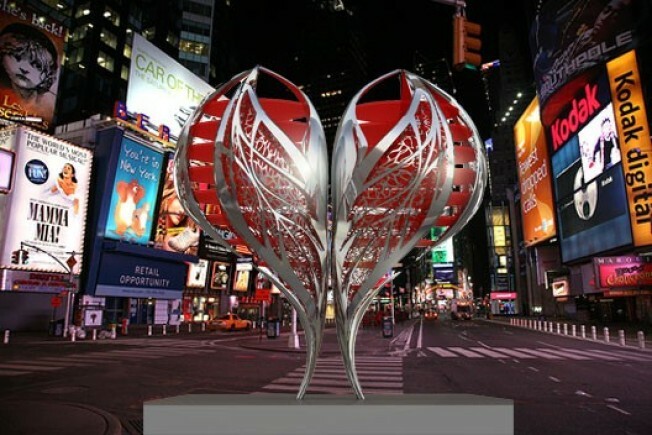 Architected by Gage/Clemenceau Architects, it's designed to fit right in, per the press buzz: "To be part of the lights of Times Square, the designers utilized a reflective surface and changing LED lighting... Inside, shelves of horizontal luminescent acrylic pulse in reds, pinks and purples."